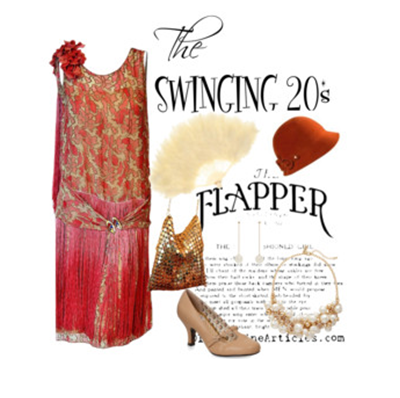 One of the most popular vintage-inspired dress designs of the 20th century is the 1920s flapper style clothing. At the time, women wanted their bodies free from the shackles of tight corsets, long and cumbersome skirts and hats large enough to house a colony of birds. In the 1920s, the word fashionable meant women daring to raise their hemlines, short hairstyles, bejewelled headpieces, fans, feathers, and freer waistlines and with post-war spending inspiring women to shop once again, a new kind of fashion therapy evolved. So, if you are like many women that love vintage fashion, clothing styles of the 1920s are feminine, chic, and body-flattering. Wearing a flapper style outfit with the right accessories, you'll look like you sashayed out of the Great Gatsby movie. A noticeable highpoint of the 1920s woman was demonstrated by the stark change in her hairstyle. Women were saying cheerio to long Victorian locks and welcomed much shorter and boyish hairdos. Popular styles that may interest you include the bob cut, shingle cut (a bob haircut with a tapered back) and the Eton crop. The Flapper style is not complete without the right hairdo – short. But if you don’t want to cut your hair short (understandably), you can always opt for a short wig – the bob style or finger-curls are very 1920s. Of all the classic women's hats of the roaring twenties, the cloche hat was the trendiest and was a very popular headpiece with its bell shape and side adornments which was anything from flowers to small feathers and geometric designs. Other hat styles include wrapped turbans, straw summer hats, and bucket hats. To add a feminine touch to their ensemble, the wealthy 1920s woman had elaborate and expensive jewels worn as headpieces in their collections. However, you don’t have to buy bejewelled headpieces because you’ll find that many with faux stones will look equally glamorous on you plus you can even make your own. By the twenties, fashion began to deviate from the more restricting clothing of the earlier years and gravitated towards simpler and more comfortable clothing like slip dresses, short skirts and trousers. Floral prints in soft pastel colours were adored and other popular colours were "Nile Green" "Sunset Orange" "French Blue" and "Maze". Beaded dresses with fringed hems were for both semi-formal and evening wear. Other formal clothes styles of the 1920s were tea-length dresses and sleeveless chemise gowns, some with elaborate beading and sequined works. If you are looking for authentic vintage shoes, that’s probably a tall order but you will find 1920s shoe reproductions; you just need to know what to look out for. 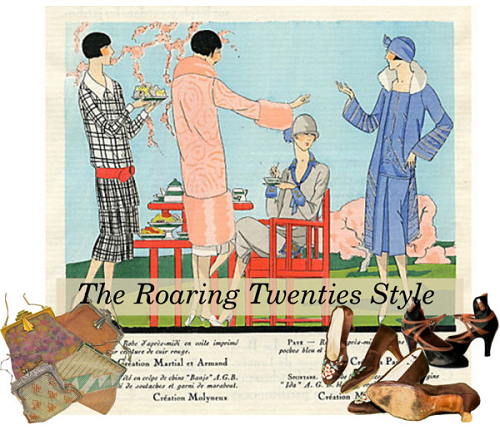 1920s shoe styles include the Roxy 1920s flapper shoes, T-Strap heeled shoes (or T-bar), Mary Janes' and the twenties Oxford shoes including tap and dance shoes. The 1920s ushered in the use of tinted sunglasses in the fashion scene. Their styles were simple circle frames made of metal or tortoiseshell with colours ranging from dark grey to deep green. When the silver screen goddesses sunbathed in their movies with a pair on, it soon became a trend. And asides it being a fashion accessory, it became a necessity for shading the eyes from the sun. If you wear a flapper style dress or a slip dress, please note that your ensemble will look unfinished without a pair of vintage style sunglasses. The first sets of stylish costume jewellery became popular in the early twenties. Many came in strong bold colours with sleek and streamlined geometric shapes that expressed the modern Art Deco movement. Pieces include large bracelets, brooches, pendants, and chandelier earrings. The 1920s woman often wore strings of beads and you can get that same look too. For that same elegance, you can drape your neck with a few layers of smooth round beads of different sizes. Glass beads or faux pearls look great if you wish to create the Flapper signature. Probably the most stunning handbags of the 20s are the beaded bags in colourful designs and the glitzy mesh bags with beading and Asian and Egyptian motifs – popular Art Deco designs. Other bags were made from embroidered fabric or hand-tooled leather (with embossed designs), and because a lady didn’t have much to fit into her handbag, they were usually small in size, unlike today’s ladies handbags. My best types are embellished clutch purses, reticules (pouch-shaped with drawstrings), and mesh bags. If you want that extra-chic twenties look, any one of the following items must be used to accessorize your apparel. These items include hand fans, hand gloves, cigarette holders (if you smoke), pillbox, a feather boa, wristwatch, and a lace-trimmed handkerchief. For an elegant vintage look, you don’t have to dress head-to-toe vintage unless it's for a costume or fancy-dress party. 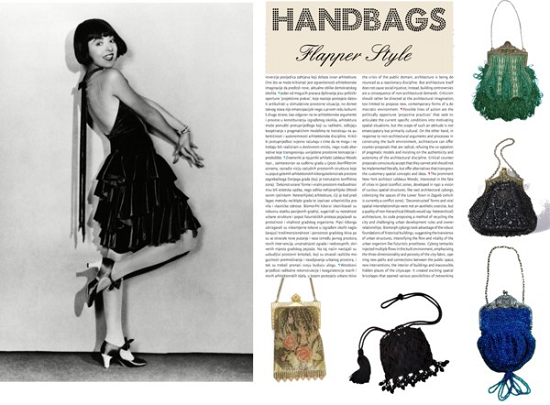 Rather, blend in the past with the present, for instance, wear the Flapper dress with stilettos instead of a Mary Jane reproduction, and use a modern clutch bag instead of a purse. If you are looking for elegant beaded dresses, then visit Zmilelee. Zmilelee is one of the best international clothing store offering worldwide shipping of evening dresses and designer accessories.